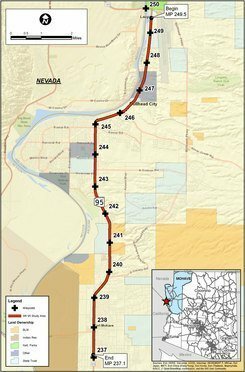 BULLHEAD CITY—The Arizona Department of Transportation (ADOT) and the Federal Highway Administration (FHA) invite the public to attend a meeting regarding access management on State Route 95 from Aviation Way to Teller Lane in Bullhead City. The meeting will also include the proposed safety improvements—Roundabouts—between Teller Lane and Valencia Road, including Aztec Road intersection. The meeting is scheduled for Thursday, April 5 from 6 p.m. to 7:30 p.m. inside the auditorium at Fox Creek Junior High, 3101 Desert Sky Blvd. The meeting will provide study information and solicit public input on study area issues and improvement alternatives. The project team will be available to answer questions and provide information. The purpose of the study is to address roadway safety by assessing various access-management options for through-traffic, and for traffic that needs local access to properties adjacent to SR 95. Those who are unable to attend the meeting can provide comments or ask questions by emailing them to Projects@azdot.gov; calling the ADOT Project Information Line at 855.712.8530; or submitting them by mail (due by May 7) to ADOT Communications, Attn: Michele E. Beggs, 3660 E. Andy Devine Ave., Kingman, Ariz., 86401. For more information about the study, visit azdot.gov/SR95Study. Materials from the meeting will be posted to the website after the public meeting.